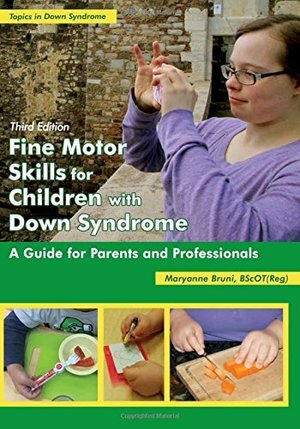 The popular book, Fine Motor Skills for Children with Down Syndrome is now available in a completely revised third edition. The author, an occupational therapist and parent of an adult with Down syndrome, describes how the characteristics of Down syndrome can impact the acquisition and progression of fine motor skills. She presents a thorough overview of the building blocks of fine motor development, from infancy through to adulthood: - Early arm and hand control - Stability - Bilateral coordination - Sensation - Dexterity Use the book's step-by-step activities to build daily living skills for home and school: - Scissor skills - Pencil grasp development - Pre-printing, printing & cursive writing - Keyboard skills - Computer & tablet skills - Dressing, grooming, and feeding skills Throughout the book, the author suggests ways to incorporate fine motor skill development opportunities into as many day-to-day activities as possible, recognizing how impractical it is to constantly be in therapy mode with a child. Suggestions for gift ideas are offered in Grandma's and Grandpa's lists at the end of each chapter. With expanded and updated information on fine motor skills and computer and personal electronic device use, keyboarding skills, postural support, sensory processing, and the adult years, readers will have at their fingertips a cornucopia of information and guidance to support the fine motor development of children and adults.